Glen Cove, NY - SCO Family of Services, the Glen Cove-based human services nonprofit, raised over $300,000 at the 2017 SCO Annual Benefit on May 11th at The Carltun in Eisenhower Park, East Meadow. Funds raised at the annual event help SCO Family of Services provide life-changing results for more than 55,000 children, teens, families and adults each year, across Long Island and New York City. The SCO Shepherd’s Award was presented to James Vassalotti of Westchester, a Partner at Vassalotti Associates Architects, LLP in Roslyn Heights. As an architect, Mr. Vassalotti had a vision to improve the quality of life for individuals with special needs through innovative design. A longtime supporter of SCO, Mr. Vassalotti has designed, renovated, and left his mark on 50 SCO facilities and residences, helping thousands of people achieve or regain greater independence. 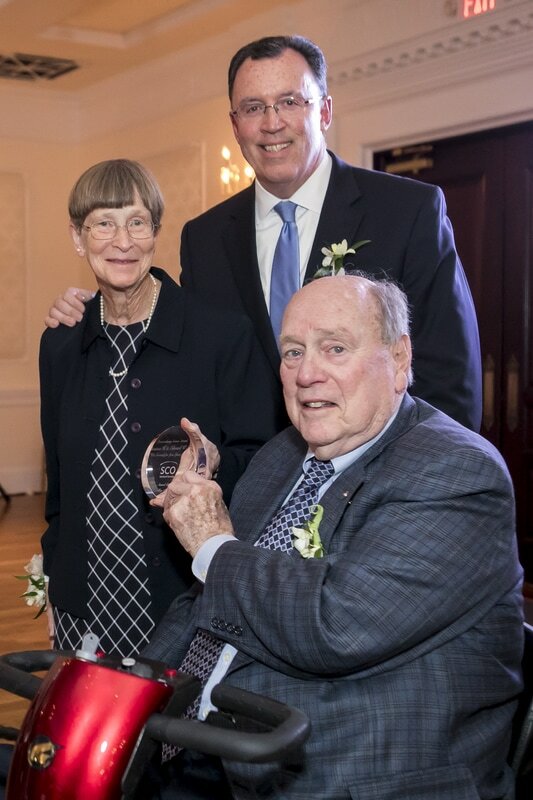 Christina and Edward Stack, formerly of Glen Head, were presented with the Extraordinary Service Award, recognizing their longtime commitment to SCO’s mission. Mr. Stack joined the SCO Board of Directors 17 years ago, serving as Chair from 2007 to 2011 and currently serving as the Board’s Assistant Treasurer. Mrs. Stack was a long-time volunteer at SCO’s Tyree Learning Center, working with children with developmental disabilities. She was also a founding committee member of the SCO Annual Spring Fashion Show. “Tonight we celebrate the culmination of this year’s work in our schools, in our residences, and in our communities. We celebrate the accomplishments of the 55,000 children, adults, and families we serve each year. We celebrate our honorees. And we celebrate all of you who help to build opportunity, success, and a stronger foundation for those we serve,” said SCO Executive Director Douglas O’Dell during his remarks. SCO extends its gratitude to the sponsors, supporters, and volunteers who made the event a success. This year’s leading sponsors included Chem Rx Pharmacy Services, Lee and Cynthia Vance Foundation, Astoria Bank, Mutual of America, TD Bank, Vassalotti Associates Architects, Whitsons Culinary Group, Kelly and David Williams, and Signature Construction Group. Additional supporters included ASF Associates Consulting Engineers, Bartel Construction Group, The Beacon Group, EBC Co., FPS Contracting Inc., Metro Environmental Services, LLC (MES), Michael Borruto General Contracting, People's United Bank, ProBuild Contracting Inc., Roux Associates, Edward and Christina Stack, SVAM International Inc., and H. Craig & Lora B. Treiber. Proceeds from the 2017 Annual Benefit help SCO Family of Services provide programs in 110 locations throughout New York City and Long Island. These include the Madonna Heights program in Dix Hills, for young women and women in recovery; The Robert J. McMahon Children’s Center in Sea Cliff, serving children with developmental disabilities, and the Westbrook Preparatory School in Westbury, NY State’s first residential junior/senior high school for students with Asperger syndrome & high functioning autism. SCO Family of Services helps vulnerable New Yorkers build a strong foundation for the future. We get young children off to a good start, launch youth into adulthood, stabilize and strengthen families and unlock potential for children and adults with special needs. SCO has provided vital human services throughout New York City and Long Island for more than 100 years. Ninety-three cents out of every dollar donated goes directly to help people in need. For more information, please go to: www.sco.org. Photo left: SCO Family of Services Executive Director Douglas O’Dell, SCO Annual Benefit Co-Chair Adam DiGirolamo, SCO Shepherd’s Award recipient James Vassalotti and SCO Annual Benefit Co-Chair and Board Vice Chair Brian Edwards at the 2017 SCO Family of Services Annual Benefit. Photo above: SCO Annual Benefit Extraordinary Service Award recipients Christina and Edward Stack (foreground) with SCO Annual Benefit Co-Chair and Board Vice Chair Brian Edwards at the 2017 SCO Family of Services Annual Benefit.